Perhaps now you understand the troubles we go through to select the lineup of the first 50 cars to fill the stalls of the Jalopnik Fantasy Garage. We presented to you theCaparo T1, warts and all, for consideration of the garage without the benefit of flowery prose or over the top hyperbole — the car itself is hyperbole enough. We wanted to see how a game-changing supercar would stand up to the harsh scrutiny of an unsoftened voting block because frankly, we're tired of everything getting in so easily. This is about whittling things down to a sharpened point, debating the merits and pitfalls of some of the greatest mechanical symphonies ever built, this should be a knock down drag out fight to get into the garage — that is unless we're talking about the Morgan Aero 8. Morgan is one of those companies you have to love. For all practical purposes they are the last of a dying breed, a company which weighs profit motive and passion on equal terms — craftsman as well as enthusiasts. When the whole world went crazy and abandoned everything traditional, Morgan soldiered on, producing their delightful, ash framed Morgan Plus 8, a legendary car in its own right, lauded for its lively handling and hairy knuckled driving personality. But while half-century old designs are quaint and draw a certain customer, everyone gets the urge to brave new paths, and Morgan set out to remake its image with the Aero 8. The story of the Aero 8 is very much a story of traditionalists finding new ways, getting out of their baked in mindset and reconsidering what they could do with what they know how to do. 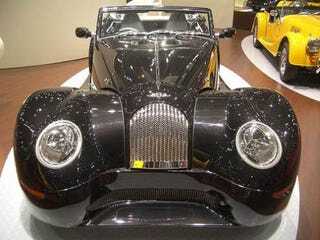 Much like every other car company started doing two decades ago, Morgan began using computers. Not only did they use computers, but they did it well. The frame would be constructed of bonded and riveted aluminum extrusions mated with kiln dried Belgian ash, and covered in an aluminum skin. As long time engine supplier Rover fell into a death rattle, a new engine was needed for this much higher performance car. There is a blind quote attributed to a BMW engineer who, upon seeing the prototype for the first time, remarked "At last, here's a car worthy of my engine" and so it was. The heart of the Aero 8 is a BMW supplied 4.4L V8 which develops a stout 325 HP, and considering the car weighs in at 2500 lbs. the power is positively stupendous. That power is harnessed by a suspension which resembles a racing car more than a road car, it is fully independent with inboard mounted springs and dampers all around. We could go on about how this car goes round the track fast enough to beat most others at or above its price range, how it bites on corners like a teething pit bull puppy, or how the interior is swaddled in cow and machine-turned steel... but that's not the 800 lb gorilla in the room now is it? All of those things are certainly reason for admiration, but the glaring fact is the glaring fact - its eyes were crossed. One would think the British motoring press would have been swinging from the chandeliers when the new car debuted at the 2000 Geneva Motor Show, but they raked it over the coals. London's Daily Telegraph called it "stupendously ugly". We couldn't agree and disagree more. The Aero 8 is ugly, but ugly badass — it wears its sheet metal with a certain braggadocio only a stupendously ugly car with stupendously amazing heritage and stupendously impressive performance can. The world is a boring place when everything looks like a Porsche or a Ferrari. Drive one of these and you know you're not following the crowd. Not only does this car fly in the face of the modern styling aesthetic, it quashes notions of what a sports car should be. The Morgan Aero 8 is a modern interpretation of all that is good an pure about motoring. It is a fourteen foot long testament to the idea that cars do not have to make sense or be beautiful to be spectacular. A velvet hammer designed on its own terms, without bothering to glance at those who would claim to be its competition. The Aero 8 is the only car you can still buy new which makes us want to wear driving goggles when the top is down, and for that we want it in our fantasy garage.